Yesterday Mum and I were at The Square – Bendigo’s Handmade Market. 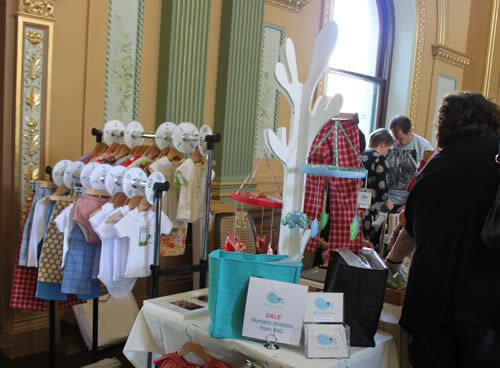 The Square is our favourite market to take our things to; it’s held in a beautiful venue (the Bendigo Town Hall), it has a great atmosphere, the girls who organise it are friendly, professional and efficient, the customers are great and there are plenty of stalls selling lots of cool things. We had more of our belly laughs that result in whichever of us driving nearly having to pull over because they can’t see through the tears. You know the ones where neither of you is making any noise, then you look sideways at each other in the middle of it and it triggers you to laugh even harder, with still no noise coming out. With autumn upon us, my new pants sold well and I’ve got lots of order to fill, along with a stash of jersey dresses to make and post. I also took an order for a pair of the pants in a men’s size! 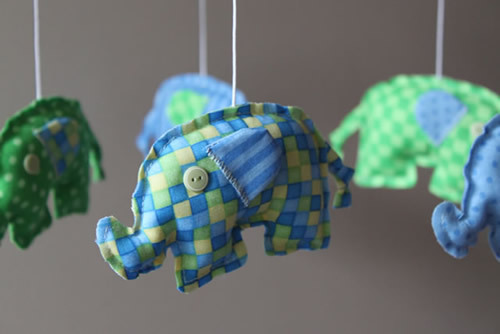 Today I’ve added to our online shop two new mobiles (including the blue and green elephants shown below) and Mum’s ruffle pants for dolls.